Located in the heart of the Las Vegas Strip at Caesars Palace Forum Shops, Planet Hollywood is ready to serve you up some delicious lunch or dinner! Feast on a choice of any of our juicy burgers, fresh salads, tasty sandwiches or chicken mac and cheese along with ice cream for dessert and unlimited sodas, all while seeing an incredible array of movie memorabilia which adorns the walls. What’s more, you’ll love the outdoor patio seating overlooking the action along the Vegas Strip! Enjoy lunch or dinner at the top of the Forum Shops at Caesars Palace on the Las Vegas Strip. This recently renovated restaurant provides an extraordinary dining experience. You can dine on the outdoor patio above the Vegas Strip or enjoy delicious selections from the menu, all while surrounded by hundreds of props, costumes and other memorabilia from movies both new and old! There is iconic movie memorabilia from decades of modern classics. Relive your favorite moments from Terminator, Austin Powers in Goldmember and Rocky. You can also see the train from Under Siege 2, and just wait until you see what they have from Misery! Your Meal Card includes VIP Seating, any Salad, Burger, Sandwich or Chicken Mac and Cheese on the menu, as well as ice cream for dessert, unlimited soft drinks and all taxes and gratuities! 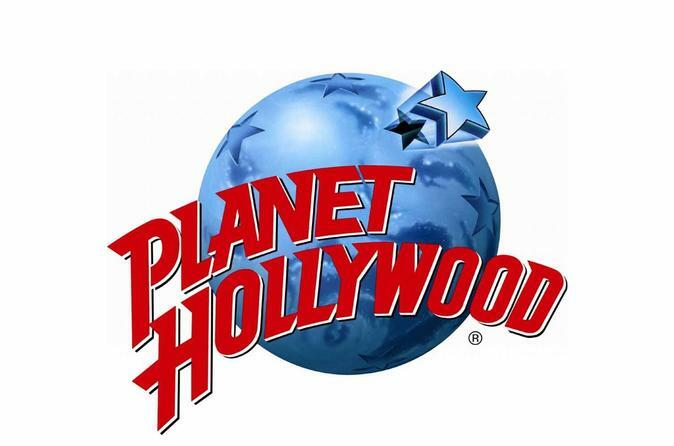 To allow for maximum flexibility, you can also purchase a $25 certificate which is good for purchases at any Planet Hollywood, Buca di Beppo, Earl of Sandwich, Cafe Hollywood or Tequila Taqueria restaurant.